I had an absolute blast creating my layout for this month's challenge at 123! 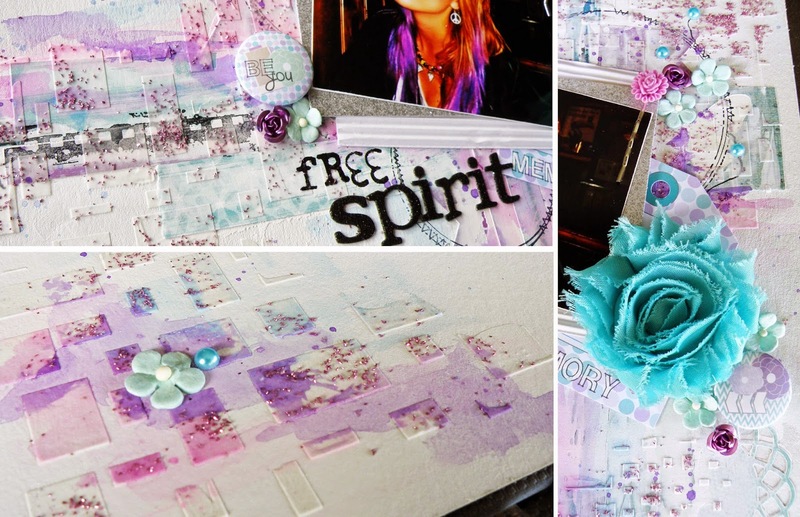 The criteria this month are the colour purple, the word "spirit" and the technique is to create with texture paste, embossing, layers etc. So, so, so me!!!! Until very recently I haven't been a big fan, or a fan at all LOL, of purple. Probably because of memories of my all purple bedroom as a child .. memories I've tried to white-wash LOL! However this is my second layout in a row creating with the colour purple, and with inspiration from, and the use of, the D-lish Scraps Just Add Paper Kit "Lilac Haze" this came together really, really easily. Oh and dare I say it LOL? I'm about to start work on another purple layout!! I'm actually quite enjoying the varying shades and colour combinations purple provides and I have a small mountain of unused products from my D-lish Scraps kit to still use. PS: Special thanks to our sponsors this month .. Scrapbook Divas, A2Z Scraplets and Scrapping Life.